Aptly, the first recipe that I decided to make from this book is called: First and Foremost Brownies. What I love about this recipe is that in addition to being super simple to make, the clean-up is also a breeze. This recipe begins by melting butter in a pot until it browns lightly and then all of the subsequent ingredients are added to the same pot resulting in minimal clean-up. I'd heard of one-pot meals before but never one-pot brownies! The process of lightly browning the butter creates subtle hints of caramel-y nutty flavors – a great feature of these brownies. Another important feature in these brownies that I must mention is the texture. These are dense, rich, fudge-like brownies of the sort that leave an imprint of your teeth after you take a bite just as you'd find with truffles. 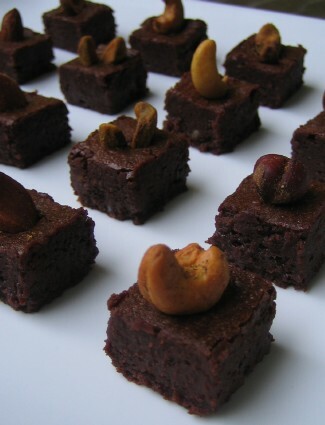 Now because of the richness of these brownies I was thinking that they'd be the perfect treat for a soiree or cocktail party by cutting them into little bite-sized cubes and arranging on a stark white plate. To add another flavor dimension I had the idea of adding spiced nuts atop as a garnish which also offsets the intense sweet flavor of the brownies. The result is an odd coupling that comes together to form the perfect match. 1) Preheat oven to 300F and line your 8×8 inch pan with parchment paper – allow it to hang over the sides of the pan as you don't just want the bottom covered but the sides as well. 2) Melt the butter in a medium sized pot and cook it until it turns light brown and as Lisa says, 'begins to smell wonderful'. Remove from heat and allow to cool – approx. 10 minutes. 3) Add the chocolate and allow it to melt into the butter – stir until smooth. (I break up the chocolate into little pieces before adding here if using a bar – the smaller the pieces the faster it will melt into the butter. 4) Add the sugars and mix well – will be grainy. 5) Add the eggs one at a time and mix all together so that the batter is thick and shiny. 6) Add the vanilla and flour – be careful not to over mix – just stir enough to incorporate the flour into the batter. 7) Add the salt and just stir to incorporate. Pour the batter into the parchment lined pan and bake it for 25-30 minutes. The edges will be firm and the center puffed and still a little soft. Remove from the oven – allow it to cool. When it has cooled stick it into the refrigerator for a few hours before slicing. 9) These brownies can stay for up to a month in the fridge as long as they are well wrapped or up to 6 months in the freezer. To make the bite-sized treats with the spiced nuts I wait until the brownies have had a chance to chill in the fridge for a few hours. Using the edges of the parchment paper I lift out the brownies and place them on a cutting board so that I can cut even one inch squares. I simply garnish each with a spiced nut and arrange on a serving platter. * I use a little less than the 8 Tbsp as I found my brownies were a little too moist when I made them the first time – this time I tried with 7 Tbsp which worked well. What a smart boy friend! Your description of leaving teeth marks and the caramel brown butter makes me wish I had even just one little one of these. Great picture! Really like the nut on the top. Perfect! I’ll take a plate of those anyday, Geneve! Wonderful! These are sooo good. Your boyfriend brought some to work and I was in the right place at the right time. These are very fudge-like. And did I mention they are sooo good? Those look great, Geneve! Sounds like a good, simple recipe. I really like browning butter, it adds such a wonderful flavor. TFE has employed the same trick…now that I think of it, I’ve not made anything for him from The Silver Spoon…hmmm. Those brownies look delicious. I’m going to Amazon.com right now to buy that book. Thanks Geneve. Keep on baking! Geneve, these brownies were a dream! I had the fortune of tasting one at work (Kareem generously shared with the office here) and they were simply incredible. You are really so talented! these look so gorgeous! Just the perfect sweet indulgence.